In addition to local processes locking up files and preventing their usage by other processes, files can also become locked by remote processes, too. Finding the remote system that has a handle(s) on the file can be a little bit more more involved. I mean this literally: a little a bit more involved. Knowing which tools to use or where to look can make this task just as simple as isolating it to a local process as outlined in part I. Normally, a reboot will resolve this issue. But that wouldn’t be any fun. 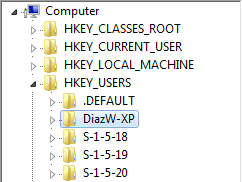 Additionally, we run the User Hive Profile Cleanup service (XP workstations)* to mitigate issues where application or service processes remains hooked to user’s registry, NTUSER.DAT and UsrClass.dat, after log off so I was interested to see what was hooked to either of these files. You can then right-click the open file and/or session to disconnect the remote handle and unlock the file. You can also use netstat from a command shell to see what remote systems have active connections to the workstation where the file is locked. Finally, it’s worth mentioning some applications may be hooking files in ways that you cannot determine using the basic methods outlined in Part I or II. These problems are generally more complex to isolate. Here is an example worth reading: The Case of the Temporary Registry Profiles. *This feature is already part of Windows Vista and 7. This entry was posted on April 4, 2012 at 3:49 pm	and is filed under Troubleshooting Tools. Tagged: Process Explorer, TCPView. You can follow any responses to this entry through the RSS 2.0 feed. You can leave a response, or trackback from your own site.